An early spring here has made women buzz like bees to honey to the shop windows, and caught some merchants short-handed. I hit three department stores, hoping to find what my mother used to call "a handful of clothes", a few pieces or an accessory to greet the season. Seeking the magic triangle of quality, style and a decent price, I avoided both the perilously pricey and the lumpy lower ends. I admired the wit in Tory Burch's Kamille deco-printed silk skirt ($325), with tromp-l'oeil gores. (At 21 inches, way too short for me.) You don't see this colourway: vibrant blue, chrome yellow, lavender and white; this stood out amid a sea of faded no-colours and navy. Tahari's Tricia framed silk shirt ($198) was another pulse-quickener. It's quiet, but says something, and the silk is a supple midweight that doesn't feel like you're wearing a nightie. I dithered. That shirt implies some upkeep and careful wear. Is that my life these days? Time for an allongé and a spin round accessories. 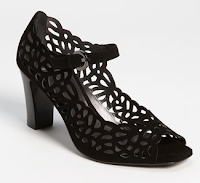 Aquitalia's Karma pump ($350): it's hard to find a black spring shoe, open yet closed, without a vertiginous heel. (It's also available in bone.) A perfect shoe that I could actually walk in. I advocate the carrying of a seasonal bag; few effects jar like a bulky, heavy-looking bag with your crisp spring things. While the selection is good, it's wise to pounce. 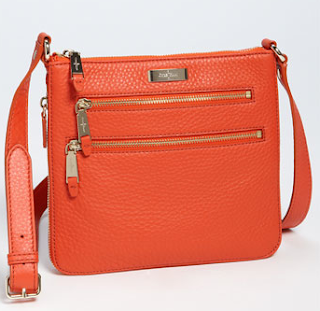 I'm also favouring the enforced discipline of a smaller bag like the Cole-Haan Sheila leather crossbody, 9 x 8 inches, either in punchy orange or a calm yellow-beige called "Sandalwood". And that's my problem: a budget means decisions; if this, not that. I came home with my head full of silks, sightings and these luminous tulips. Spring on my table, if not on my back. 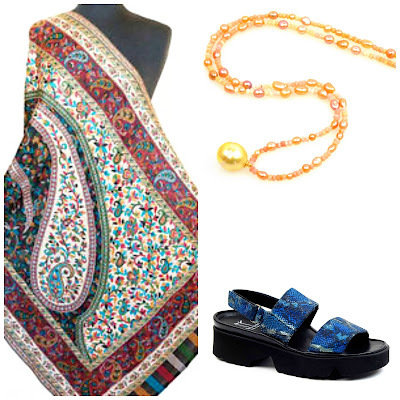 You have highlighted some beautiful spring items. I do like the dress in particular. I too tend to avoid clothes that require much maintenance. Love the shoes (will have to show Miss Em, though they are way out of her budget). 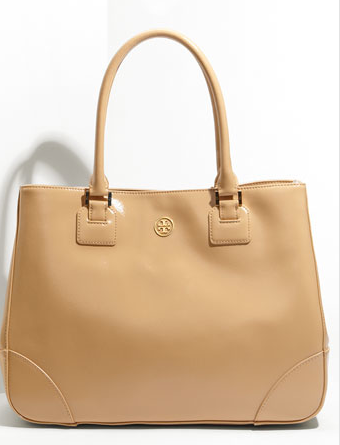 And I also like the Tory tote, even though I generally find her stuff overpriced and with TOO BIG LOGOS. I did a trial run, previous weekend, bought nothing. Another practice, a few weeks back, with Sal and Audi. This weekend I was ready for the real thing. Phew. Since I'm back at work the budget has expanded. Love the pretty spring things you have posted. There are such nice prints this season, although mostly I've just been looking. 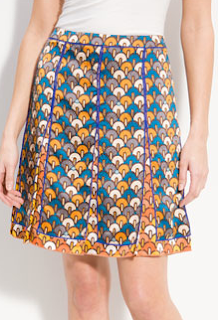 I saw a lovely skirt with a Clarice-Cliff like print online, but forgot to save the link and it was too short anyway. I do need a spring tote as all mine are too dark, or too small to carry items for two. I wouldn't have thought to look at Tory Burch as the logo usually scares me away, but I'll have to check it out. Spring has arrived here in NM and I'm struggling with the "size issue" as I shop for a new bag. Love the Cole-Haan. My lifestyle changes so much in spring that I always want to think twice about wardrobe purchases -- the stores are so seductive at this time of year, as you've pointed out through your captivating choices. But I'm at home marking or out in the garden weeding -- with a summer of more relaxed dressing ahead. Besides that, we usually travel in May, which, yes, could provide an excuse for shopping, but a capsule wardrobe has different demands than the kind of wishing I start doing on a spring shopping trip. So thanks for the vicarious pleasures of your window-shopping, and I may just follow your lead and bring home some tulips. I ventured out yesterday on lunch break where Spring Fever was in full swing -- long lines for dressing rooms. I'm on the hunt for a sleeveless spring blouse -- that's blouse, preferably cotton or silk, not a t-shirt -- that I can wear under a jacket, but I don't know where to find one! It seems like everything is a knit. Fresh flowers--always the right choice! I love that Tory Burch skirt, though--walked past her boutique in Miami last week, and the colors were amazing; the window looked like a jar of jellybeans. I'm with you as to the little brass feet on handbags. The toffee-colored Michael Kors tote my daughter gave me for Christmas has them, and they do save wear & tear on the leather. All the bags you've shown are beautiful--must be hard to choose. Shopping for "a handful of clothes" (perfect phrase) myself before traveling, I was surprised by one of those occasional items of uncommon quality in our local Banana Republic: a nicely finished navy Chanel-style Spring cardigan with real brass buttons and little pockets. It came in Petite sizing, too, so it actually fits! 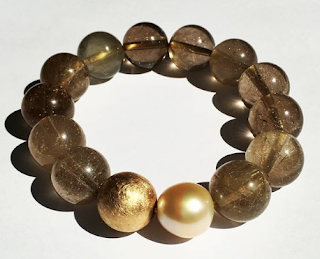 A lucky find, and with a navy-and-white-striped Gap tee underneath, breezy enough for warm days, yet still somewhat polished. Several pretty options here...I especially like the bags. Agree about the brass foot issue, but I have what I think is a good solution: a great bag hanger that not only looks better than those cheesy hooks, but is extremely sturdy. Check out www.clipa.us & see what you think. Tory Burch should be paying attention to this discussion! I too hate big logos on bags (or anything). Last year I was hunting for a spring bag, and most were either logoed or blingy, especially Coach, which used to have such nice bags until they veered off into tacky-bag world. I found a lovely one at Cole-Haan, in a pink-tinged beige, and only the teeniest of logos. Coach does seem to have gotten the message, though, lately at least some of their bags are more like the old elegant, logo- & bling-free style. helen: I really want a dress with a non-repeating or placed print. pseu: Maybe she got the message re the huge logo? Shopping on a trip is fun but I have to be really sure as returns are a whole other story. Frugal: I intensely dislike big logos too. Mardel: Too-short skirts (and dresses): a few smart makers (Boden, Poetry) offer two lengths but most cut only one *short* length! Few prints hold my interest after a year which makes me slow to commit to them. Jane W.: One can actually learn to carry less, I've had to. materfamilias: That's right, the work and non-work clothes can be quite different. I need so little in the former category now but can always use a 'good dress'. Gardening is the perfect way to use up jeans that have seen their best days. sisty: A sleeveless blouse is a tricky item (for the manufacturer) as bust and armholes have to fit perfectly. So is a knit, but it's a little more forgiving. Have seen a few in local boutiques but that won't help you. C.: Your sweater sounds so fresh and spring-y! BR yields occasional surprises and is always worth a look. You are lucky to have a handbag with feet- hard to find. Jill-Ann: Thanks for the link; the plain ones are acceptable though I really prefer not hanging a bag off a table. They remind me of those clips women used to wear at the back of a jacket in the '90s, more visual clutter. Cole-Haan make some lovely bags and the once-venerable Coach seems to be trying to recapture some of the grown ups with the Coach Classic line. Duchesse, I agree that hanging a bag off the table isn't always optimal, but it depends on the condition of the bag and the floor! Where my "Clipa" is essential is in a public restroom that doesn't have a hook on the door! Mine is strong enough to also hold my tote, if at the airport. 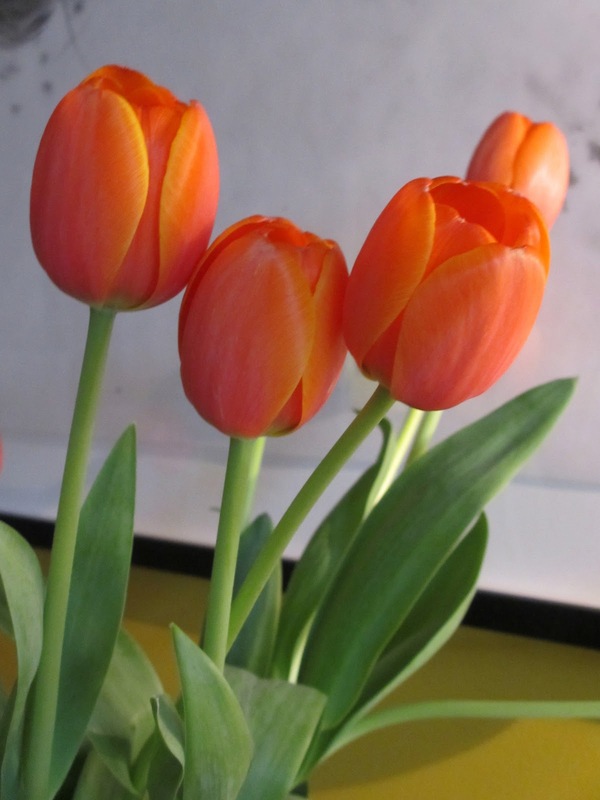 The tulips are gorgeous. I spotted the Elie Tahari dress at the Bay last month - it is beautiful. I also saw there was a top in the same print and fabric. Lovely choices, all! I've been looking for a silk or cotton print in nice spring colors. I found one that's nice enough to work, but I'm spoiled by seeing all those Erdem prints that Blogger Vivienne has shown! The top designers are really separating themselves from the knock-off companies by the quality of their fabrics. Re:handbags, Brooks Bros has some nice ones, and the golden fleece logo is small and discreet on the zipper pull. A note to Sisty: Banana Republic has three sleeveless button-up blouses you might find interesting: the collarless "Silk Safari Tank" (in black, taupe, citron or coral) and off-white "Silk Coco Tank," plus a white cotton "Twist-front Shirt" with collar. All come in sizes 0-16, with Tall & Petite sizing available. You can check them out online. Good luck! SewingLibrarian: In my recent posts on luxury, I observed what you have. 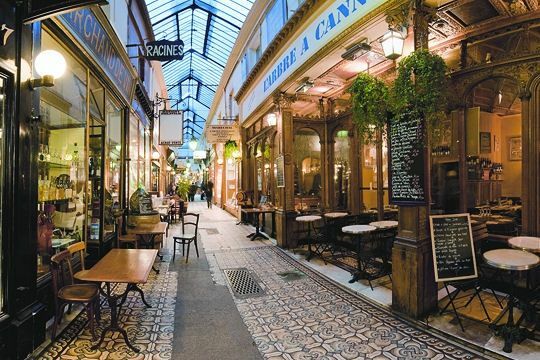 The high end of retail should provide more delectable fabrics, well-designed prints and better dyes. c.: Thanks; I love it when this happens. Anna: Thanks! Just last evening I was reading the current issue of "The Gentlewoman", which features Kirsten Owen in some pricey clothes (Dries Van Noten, Y3, The Row) styled with rollneck sweaters from LL Bean and Winter Silks. The Cole-Haan bag is so charming. I was attempted by a nice skirt and top by Marimekko. Of course the only Marimekko Shop in Germany didn't order the La Strade pattern, instead they try to sell those awful and infantinel patterns which you can wear to the kindergarten. barbara: I knew what you meant and smiled. While I like the stripes and many of the colour combinations very much, many of the Marimekko patterns (on clothes) are too large-scale on me. One has to discern between playful and playschool. In nearly all cases when a TV production involves a presenter, a form of narrowly defined beauty is part of its shallow entertainment package. Saying looks should not count *in a visual entertainment medium* is naive. Gill's viciousness, whether aimed at chefs or classicists, sells and he knows exactly how and why. He too is a content provider, just in a glossier cover.